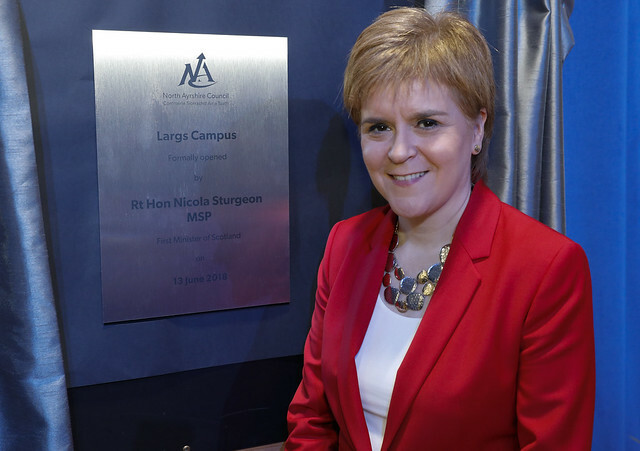 The First Minister visited North Ayrshire to officially open the new Largs Campus – as the total number of new or refurbished school buildings exceeded 750 since 2007. The campus provides new homes for Largs Early Learning Centre, Largs Primary, St Mary’s Primary and Largs Academy. The First Minister visited all four parts of the campus to meet pupils and staff, before taking part in an official ceremony which included a performance from the campus choir. The Largs Campus building project received funding through the Scottish Government’s Schools for the Future programme. Beginning in 2009, Schools for the Future, is investing more than £1 billion to deliver 117 new schools. 87 of those are now open – with the rest due to be completed by 2020. When combined with the number of schools built and refurbished by local authority partners – more than 750 schools will have been rebuilt or refurbished since 2007. On the same day, Deputy First Minister John Swinney opened Dundee’s new Baldragon Academy, and Education Minister Shirley-Anne Somerville opened Edinburgh’s new Boroughmuir High School – both also funded through Schools for the Future. I am delighted to officially open the tremendous new Largs Campus buildings. It’s clear to see that the pupils and staff are all enjoying and benefiting from their new learning environment.